Wordless Wednesday – Fried What? In just two days the Illinois State Fair will be opening the gates and I’ll be on a mission to find freak, fun and fabulous fair foods to share with you. 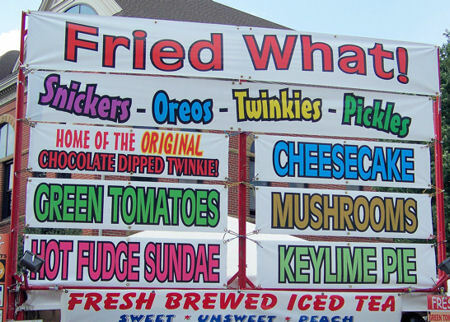 In the meantime, check out this fair stand I found last year that deep fried everything from salty pickles to sweet Twinkies. I even worked up the nerve to try some deep fried Oreos, which if you are wondering were completely disgusting! I love Fried Mushrooms. YUMMY!!!! Happy WW! I wonder how the Twinkies would taste! At least they have sweet tea! LOL! Fried Oreos are awesome!!! Just sayin…. I actually 2nd the deep fried oreos being awesome. My 2nd favorite after Zeppoles 🙂 Although yours looks a bit yellow. Maybe a different batter. I love me some fried pickles. So good! You are making me hungry girl! Oh this site is so yummy! Who comes up with this stuff? Like others have mentioned, maybe the mushrooms. As for the rest, maybe some things just shouldn’t be fried. Ewww . . . although fried ice-cream does make me a bit curious. LOL! I took a picture at our fair this past July, too of the deep fried stand. This year, they had deep fried BUTTER. *gag* I bet you’ll see that, too. I don’t think my stomach is ready for all the fried food. LOL…is there anything they don’t fry??? What?! Everything Fried? Looks like I won’t be sticking to my diet. lol! It’s amazing some of the things that they will fry up. My favorite are the fried pickles! Yum! Sign me up for some friend pickles and sweet tea! YUM!! Your blog is too cute! fried oreos are one of the best guilty pleasures I’ve ever had. We have a Wings place a few towns over that does fried Snickers and fried Oreos. I love fair food! 🙂 Can’t wait to read/see more. I just had fried pickles for the first time…they are quite tasty! 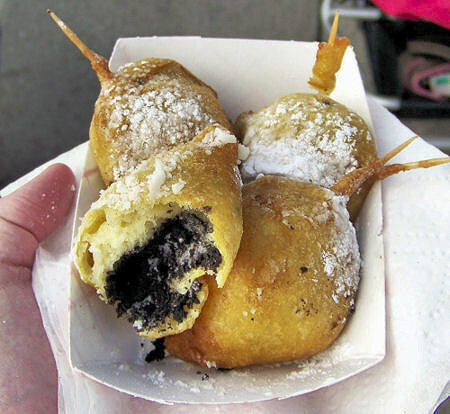 I have never tried a deep fried Oreo but I think I would like to! I love trying the different foods at the fair. This year I only tried the Tri-Tip sandwiches, nothing fancy. LOL We like the Fried Oreos too….they sell them on the Jersey boardwalks. But, I would much rather have the Fried Mushrooms…YUM! Congrats on being featured on Spotlight Saturday for your food blog. I don’t have a food blog, but I was also featured for my Tasty Tuesday weekly linky. Feel free to stop by and link up when you can. 🙂 I’m now a follower too! The Iowa state fair is this week too. I don’t know about fried oreos, but I just posted a recipe for oven fried pickles. Fried pickles are suprisingly delicious!